Constantino Paul Castellano (June 26, 1915 – December 16, 1985), better known as Paul Castellano (or PC to his family), was a mafia boss in New York. He succeeded Carlo Gambino as head of the Gambino crime family, then one of New York's largest Mafia families. In early 1985, he was one of many Mafia bosses arrested on charges of racketeering, which was to result in the Mafia Commission Trial; in December of that year, while out on bail, Castellano and an associate were shot to death outside Sparks Steak House in Manhattan on the orders of John Gotti. He was born in Brooklyn in 1915, to Giuseppe Castellano and Concetta (maiden name Casatu). Paul's father was a butcher by trade, and was also an early member of the Mangano crime family, forerunner of the Gambino family. He logged his first arrest in 1934. The 19-year-old Castellano refused to identify his two accomplices to the police and served a three-month prison sentence on his own, his refusal to co-operate with the authorities giving him a good reputation as a 'stand up guy'. 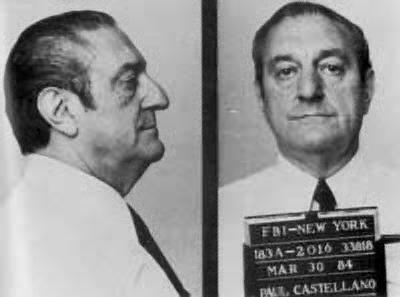 Castellano often signed his name as C. Paul Castellano because he hated his first name, Constantino. Eventually he became known as Paul. Castellano became a member of the Mangano family sometime in the 1940s, and was named a capo under Vince Mangano's successor, Albert Anastasia. In 1957, after Carlo Gambino became boss, Castellano attended the Apalachin Conference. With his butcher's background, Castellano launched a successful wholesale poultry distribution business that at its height, supplied 300 butchers in the city. He also had two major supermarket chains, Key Food and Waldbaum's, under his thumb. Castellano became boss after Gambino's death in 1976; he served as acting boss for much of 1975. Theoretically, the frontrunner for the boss's post was Gambino's underboss, Aniello "Neil" Dellacroce. However, by nearly all accounts, Gambino designated Castellano as his successor because Gambino was married to Castellano's sister. Gambino was known as a man who believed that family should come first. Dellacroce decided to support Castellano's elevation, and Castellano retained him as underboss. Castellano saw himself more as a businessman rather than a hoodlum; in fact, his longterm goal was legitimacy. Under Castellano, the Gambinos expanded their already strong influence on the building industry. For decades, the Gambinos had enjoyed a hammer lock on Teamsters Local 282, which could literally bring most construction jobs in New York City to a halt. His connections expanded to places as far away as Kuwait. As part of an effort to lead a more open life-style, he purchased a large mansion in the prominent Todt Hill neighborhood of Staten Island. He didn't entirely forsake murder, however. For example, after finding out that Nick Scibetta, the brother-in-law of a rising star in the family, Sammy "the Bull" Gravano, was engaging in what was seen as behavior embarrassing to the family, Castellano ordered him killed. Castellano also fostered or developed important alliances for the Gambinos, such as with the Irish-American mobsters from Hell's Kitchen known as the Westies, who Castellano would call upon as enforcers and hitters, and with a group of Sicilians known as the Cherry Hill Gambinos, who imported and trafficked large quantities of Sicilian heroin throughout the United States. Some Gambino wiseguys began losing respect for Castellano, feeling he had lost touch with the essence of the organization. They felt he was too distant. Dellacroce, however, supposedly wouldn't approve of an attempt on his life, and thus they could not try to harm him. In the early 1980s, Castellano became worried about the ambitions of the ruthless John Gotti, a protègé of Dellacroce, and the pair seemed to be on a collision course. Castellano repeatedly made it clear that he would kill anyone who was dealing in narcotics—knowing that Gotti was doing just that. Meanwhile, Gotti began to turn mobsters against Castellano, which was not very difficult given the growing discontent in the family. Castellano rarely left his mansion and, although he demanded tribute payments from them, he rarely bothered to mix with the foot-soldiers of the family, as if they were beneath him. Although some felt insulted, Castellano was closest to a four-man-panel, consisting of capos Thomas "Tommy" Gambino, Daniel "Danny" Marino, James "Jimmy Brown" Failla and Thomas "Tommy" Bilotti. Castellano ordered the murders of James "Jimmy the Clam" Eppolitto and his son, both being former crew members. The hits were carried out by Anthony "Nino" Gaggi and Roy DeMeo. Also, after being indicted with trusted captain Anthony "Nino" Gaggi over the Roy DeMeo stolen car operation, Castellano ordered DeMeo's slaying out of fear the ruthless killer may cooperate. In early 1985, he was one of many Mafia bosses arrested on charges of racketeering, which was to result in the Mafia Commission Trial. Castellano was released on $3,000,000 bail and rumors were floating about that the 70-year-old might try to cut a deal with the FBI and turn on his criminal associates in order to avoid prison. There were also rumours that he had undergone an operation to cure his impotence in order to help him carry on an affair with his young maid, rumors that Gotti happily spread. Paul Castellano didnt mind being tagged as a murderer, However, according to the book Murder Machine by Gene Mustain and Jerry Capeci, Castellano got offended when he thought that a police officer had implied that he was less than a gentleman. When Detective Kenneth McCabe placed him under arrest, he did not protest. But when McCabe mentioned to Castellano that his late cousin, Carlo Gambino had been a "real gentleman", Castellano looked hurt and then responded, "What? I'm not a gentleman." On December 2, 1985, Dellacroce died of lung cancer. Castellano then made two major mistakes. First, he did not attend Dellacroce's funeral - which was viewed as highly disrespectful. Second, Castellano then named his bodyguard, Tommy Bilotti, as the new underboss. Although Bilotti was a loyal mobster, he was also a brutish loanshark with little of the diplomatic skill required to hold such a high rank within the organization. Within two weeks of Dellacroce's death, on December 16, Castellano and Bilotti were shot to death outside Sparks Steak House in Manhattan on the orders of John Gotti. They had been lured there supposedly to a meeting with Gotti in order to iron out their differences. The hit team included Vincent Artuso, Salvatore "Fat Sally" Scala, Edward Lino, and John Carneglia.